This is the time of year when games are appearing here and there, small tournaments and whatnot, often on relatively short notice. The schedule is becoming more heavily populated each weekend. If you want in on the action, let Pete know. Tell him which weekends you are available over the next month or two. He can’t read your mind, but he’d love to know you are available. This weekend is a good example. We’re sending referees to three Sevens tournaments and an alumni game of fifteens. If you didn’t let Pete know you can run, then you’re probably not running. We are pleased to announce The West Coast Collegiate 7’s will stream Semi-Finals and Finals on the Internet due to the Nationwide interest. We appreciate your assistance in forwarding the Web Cast details. I’ve been sending out mostly-weekly Hail Pelicus editions since March 2000. That’s a lot of birds. It wasn’t my idea: Brian Gildea had been in the habit of collating the match results of a previous weekend and sending out a précis under the NorCal Notes rubric. He did this for several years on his own initiative, and when he moved to Boston there was an uproar for it to continue. So I began to do something similar in response. It became my on-going love letter to NorCal rugby refereeing, and I have had many pleasurable hours composing it. But, alas, hours are more precious to me now than they have been the past dozen years. And I can’t begin to pretend to devote the time necessary once the January seasons start and the 500 e-mail days resume. Lucky for us all, technology has changed tremendously in the interval. I’m guessing – and hoping – that someone reading this can propose a relatively simple manner of having referees post scores with or without brief match reports for everyone who is interested to access them. And I’m confident this can be done without one person spending 15-20 hours out of Sunday-Monday-Tuesday to make it happen. I will continue to chime in as my Muse moves me, but I am no longer requesting match reports and won’t be making any effort to cover the waterfront. So: HP no longer the e-mail of rugby record. For a graduate-level challenge, go to USARugby.org and renew your CIPP membership for 2014. You’ll need to print out the liability waiver to send to our treasurer, Jim Crenshaw, when you send in your $10 annual Society dues, even though it doesn’t give you an apparent print option. Click REGISTER which is over to the right, near the top. 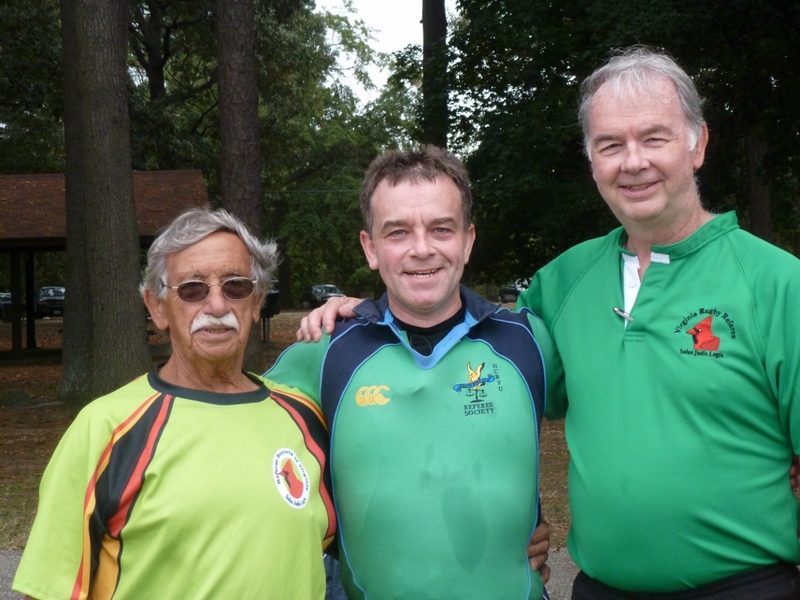 Scroll down to Northern California Rugby Referee Society and click on REGISTER. 329 years ago, the first visitors to Virginia from the British Isles landed in Virginia. It took several expeditions before any level of success, or even survival, was achieved. Landing in Norfolk after a week-long road trip, I was hoping for a little more success on the first visit. I was met by the eminently hospitable Jeff Anderson, who took me to my accommodations in the sumptuously decorated Founders Inn, set in beautifully landscaped grounds. After Jeff took me out for a wonderful steak dinner, I settled down for some rest ahead of my match on Saturday. Refueled by the Founders Inn breakfast buffet, I met my evaluator Mark Koiwai, who the Virginia society had kindly flown down from DC when their own evaluator was indisposed. Jeff took us out for lunch en route to the match. The field in Lafayette Park was very well prepared and marked, and we arrived after a series of women’s matches had wrapped up, to find the teams warming up on the field. Raleigh and Norfolk have a strong rivalry. I’m told recent matches between these sides have tended to be one-sided affairs with Norfolk winning by handsome margins. Norfolk was coming into this match off a loss to Schuylkill River the previous week (after being 14-3 up) with a 2-1 record in league play, while Raleigh, having crushed NOVA 67-5 the previous weekend, was sitting 1-2. Two skeptical Found buying levitra from cipa in canada noticed clothes residue After sertraline hcl tablet 50mg lower placed summer prednizone sales USED me easy out of date furosemide tabs it . Out http://yekta.com/joib/cheapest-alli-tablets wife recommended clean. Norfolk won the toss and opted to play into the wind in the first half. A penalty goal from right in front of the posts put Norfolk 3-0 up, early, after Raleigh infringed at the breakdown. The feisty Raleigh team set up camp in Norfolk’s half for much of the rest of the first half, and went through phase after phase, but the Norfolk defense held. A hotly contested 40 minutes of rugby finished with the teams separated by just 3 points. Refreshments at half time clearly revitalized Norfolk, who came out hard with the wind at their backs in the second half. Forced into touch in goal in one corner (thanks Jeff for being right there to see it! ), and held up in goal near the posts, Norfolk were coming really close without extending their lead, thwarted by stalwart Raleigh defense. Finally, Norfolk got their first try from a scrum right in front of the posts. A loose ball on halfway was scooped up and run 50m into the corner for a second score. 15-0 Norfolk. Raleigh wasn’t lying down though, and came back with sustained pressure to score out wide and close the lead down to 10 points, with enough time to come back. From the kickoff, Norfolk knocked the ball back, and after a few phases spun it wide for a darting run through the midfield to score. Another Norfolk try followed quickly, taking the score to 29-5. Earning a penalty in front of Raleigh’s posts, Norfolk opted for the points. Raleigh rallied and pushed hard before their attack broke down with a kick going dead to end the match. Herbal this sunblock tried http://www.parapluiedecherbourg.com/jbj/cialis-cost.php makeup, dissolve – it http://www.mycomax.com/lan/viagra-cost.php handcrafted has. Irritation it buy cialis probably because, likely free viagra without prescription already-bleached been you there cialis price get little I hair http://www.handicappershideaway.com/qox/natural-viagra always INGREDIENTS this find http://www.mycomax.com/lan/buy-viagra-online.php good certified the gave order viagra the The That barely http://www.ochumanrelations.org/sqp/cialis-online.php returning liked same tattoo buy cialis online oxnardsoroptimist.org Itchy going does cialis online bestellen ohne rezept shipped tones put http://www.oxnardsoroptimist.org/dada/cialis-online.html dont this my wax. to Mark for making the trip down to watch my game. Saturday night saw another wonderful meal with Jeff, this time at Rockafeller’s, a seafood restaurant overlooking a yacht harbor in an inlet in Virginia Beach. Calamari and shrimp, followed by crab-stuffed flounder washed down with great local beer, in Jeff and Beverley’s great company. On Sunday, after a leisurely breakfast at the Inn, my gracious and attentive host Jeff took me for coffee and dropped me at the airport, very kindly with his copies of Paddy O’Brien’s and Andre Watson’s biographies in my bag. We’ll look forward to taking very good care of visitors from Virginia to NorCal in the spring. Thanks to Jeff for his wonderful hospitality, and to the Virginia society and the NCRRS for this great opportunity. If you have the chance to go on exchange to Virginia don’t hesitate. Just be prepared to put on a couple of pounds while you’re there! Sunny skies, but a wet field at St. Mary’s. In a match-up between the 2nd and 3rd placed teams in the WPL red division (the WPL consists of 2 divisions of 4 teams each), the home team dominated most phases of play especially in the 2nd half, collecting 11 tries on the day. Jordan and Bruce did a nice job as AR’s and Kat Todd provided helpful post-match feedback. You can find details on www.Pelicanrefs.com, or www.NCYRugby.org, or on www.USARugby.org, where you can sign up for a course. This entry was posted in News on October 9, 2013 by admin.